These are exciting times for PLS (Passenger Lift Services), the Smethwick based bus and coach passenger lift manufacturer. Not only has it been incorporated into Mobility Networks, the international provider of access solutions for accessible vehicles, it has also consolidated its operation by moving everything to a single site. This is all topped by the launch of company’s latest product, the EQ Coach Ski-Locker Lift. It is certainly not a company standing still. Chris Peat met its MD, Adam Beck, to find out more. Previously based across three sites in the Smethwick area, PLS moved into new premises housing the entire company on one site in April 2014. Still within Smethwick, it saw the whole operation reorganised to fit into one factory, with all staff now together. It is the first time since the company was founded that it has been united within a single unit. 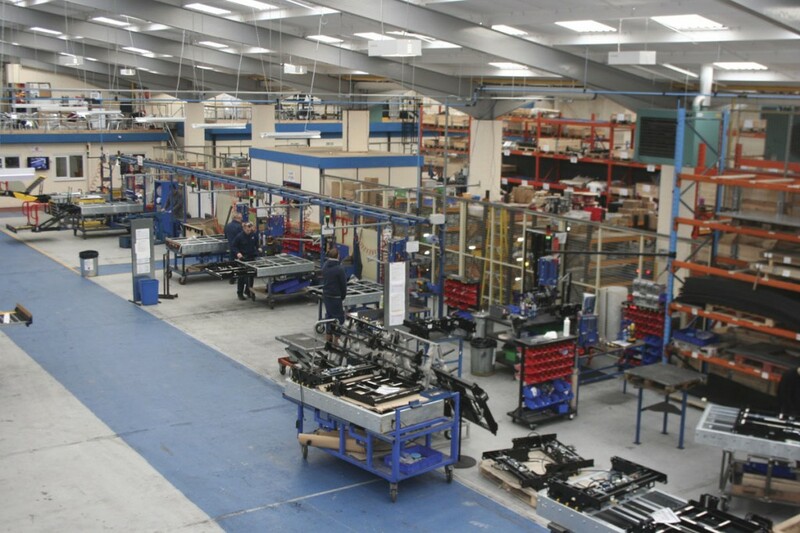 Adam said the move has resulted in more space for the company but less machinery, as it is no longer necessary to have duplicate equipment in each workshop. It has also improved communication, speeding up the manufacturing, sales and distribution processes. Staff who would have to phone between offices or make the trip over to another site are now often within speaking distance of their colleagues. Since making the move, the company has also been constantly working towards the creation of a more efficient manufacturing process. Consolidating all PLS activities into a single site is part of a wider restructuring of the company. It has seen the management team reshuffled, with Adam Beck made MD in July 2014. 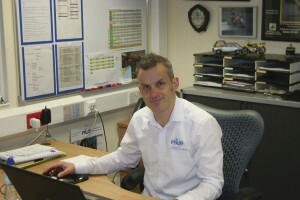 Adam had joined the business full time in 1994 following successful completion of an Engineering and Production Degree and a thesis on wheelchair tie-downs. He had previously worked for the company as an intern between university terms, through his friendship with fellow Kart racing enthusiast, Alan Ford, the company’s founder. Adam began his career as Development Manager working in the R&D department and helped support the introduction of PLS’s first coach cassette lift. A ‘radical new concept’ in passenger lifts when it was launched, this pioneering solution has played a major part in transforming the coach travel experience for many mobility impaired passengers, especially those in wheelchairs. The management changes also saw an alteration to the roles of the other directors. Instead of each of them all having a say in all general decisions, they have each now taken charge of individual responsibilities, from manufacturing to sales. Additionally, the company has recently appointed David Cunliffe as its new Technical Lift Sales Manager to support the UK coach and bus sector. David’s most recent position before joining PLS involved direct sales for MAN Truck and Bus Ltd, focusing on bus and coach sales. He has over 35 years experience in the sector and has extensive sales and engineering contacts with leading brands such as Ford, Mercedes, Iveco, Renault and Volkswagen. The PCV market is an area the company is keen to expand even further into. The development of the company, with a slicker management structure and manufacturing process being put in place, comes at a time when business is proving good for PLS. 2014 saw well over 1,000 individual lifts sold, a significant rise after the slight lull it experienced in the recession. On the day of my visit, Adam had just gained an order from the Spanish subsidiary of a significant global coach manufacturer. ‘We must be doing well to sell to Spain,’ said Adam, considering the country’s competitive market for PCV lifts. Around 50% of its business comes from overseas, claimed Adam. He had also recently had an order from Australia, a country it has dealt with for 15 years, selling anywhere from five to 40 lifts there annually. ‘Australia has realised that the quality of some Far Eastern lifts that many over there were using is not as good. They’re now looking at the European manufacturers for lifts,’ said Adam. Orders it receives from Australia tend to be for bespoke lifts, which are a big part of what PLS offers. The company does provide a standard range, but this can be modified to the customers’ needs. He described his lifts as like ‘Lego’, all the individual components can be removed and replaced with, for example, a longer or shorter version of it and extra parts and features can be added if required. All the design of its products is done in-house, the advantage of which is it gives the company more control over its wares and its quality. It aims for a lead time of four weeks for delivering specialist bespoke product designs, from scratch to having a completed model available. A third of its sales are of fully bespoke offerings, another third are standard models and the rest of sales are for standard offerings with slight customisation. It can also team up with operators who may want a specific lift. The fact it constructs the products in-house means it can produce one-offs, there is no minimum order quantity it needs to fulfil. Providing bespoke solutions may prove more costly, but it is what ‘keeps the company evolving’, with the constant alterations made to the products being used in future designs. 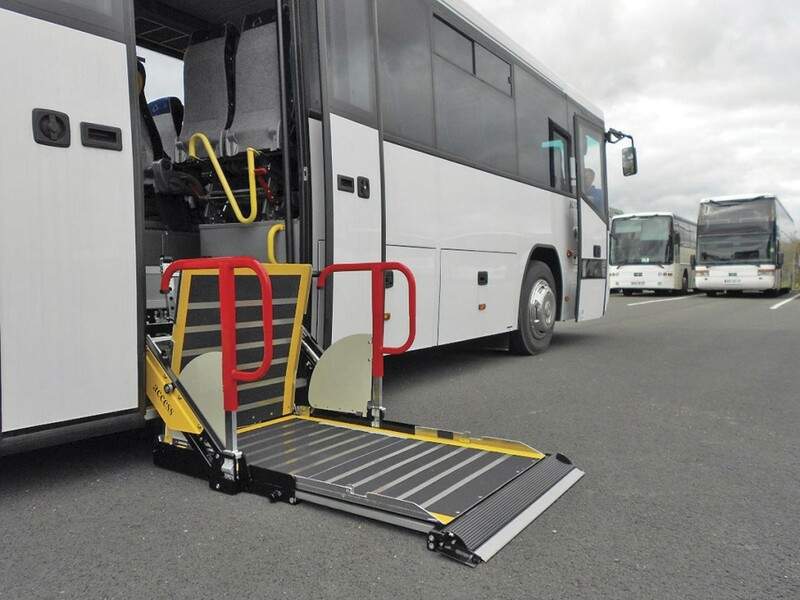 PLS often works with coach and bus manufacturers to incorporate a lift into their vehicle design. Adam said his designers visited the Salvador Caetano plant to help them fit a lift into the technical drawings of one of their new vehicles they were working on. The coach manufacturer’s own team were stumped, but after a couple of days thought and discussion over a drawing blown up to 50% of the vehicle’s full size, the PLS designers achieved it. Another manufacturer it worked with recently was VDL. The coach builder required a cassette lift, but due to the extra space taken up by Euro6 engines, it could not be fitted in the bottom of the locker, where it has historically been fitted. The same challenge is being faced with other Euro6 vehicles, according to Adam. The answer was to install it within the ski locker, a solution he believes is going to be seen more regularly with Euro6 vehicles. The fruit of this labour with VDL was the EQ Coach Ski-locker Lift. The model was originally launched at the IAA trade show in Hanover, but you may have seen it at the last Euro Bus Expo in November, where it was displayed on the Mobility Networks stand. The EQ lift on display represented the latest evolution of PLS’s Ski-locker Lift as it encompassed a new, more aesthetic design. With a 400kg safe working load (which can be hydraulically upgraded to 500Kgs without the need for mechanical changes), the one piece platform is designed to deliver safe, sturdy and reliable access for wheelchair passengers and can be either retro-fitted or installed during a new build. Its position within the vehicle is intended to ensure protection from the corrosive effects of road dirt, salt and spray. Inbuilt anti-rattle technology means no additional noise is produced when in transit and this latest design conforms to all current EU safety legislation. Handrails have also been enhanced to ensure smoother, easier deployment and storage so usability is even more efficient. Featuring GPS technology enables PLS technicians to proactively resolve servicing or maintenance issues electronically anywhere in the world. This is intended to keep fleet down-time to a minimum as well as continually optimising lift performance. The platform size is 825×1,220mm and incorporates an anti-slip surface with high visibility edging for added safety. 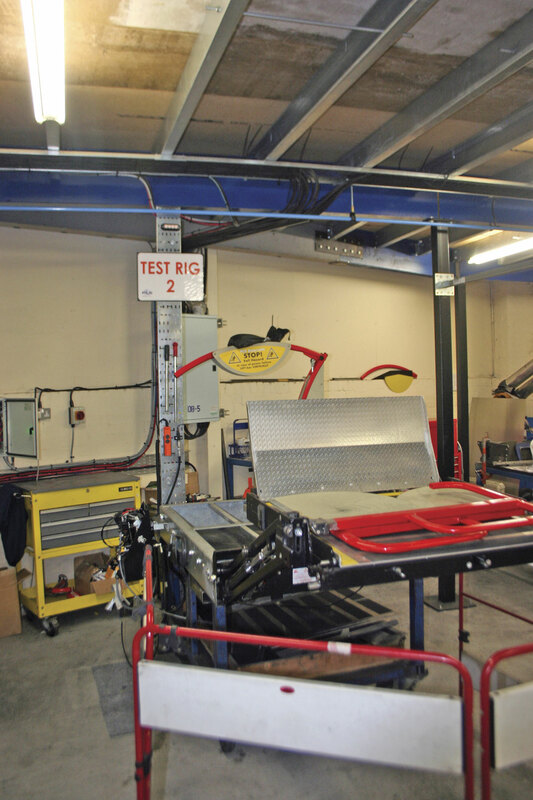 VDL ran a comprehensive testing process before selecting the model, which saw it purchase various lifts from around the world for trials. Adam said PLS’s option was chosen because both itself and the manufacturer share the same aim of being at the top end of the market. The main points VDL liked about the product were its build quality and its ability to lift high weights, as well as its stability. Since its launch, it has received interest from two other major coach manufacturers, who have requested a similar product. PLS’s new EQ lift gained a lot of attention at Euro Bus Expo. It was demonstrated alongside the ingenious Front Entrance fully automatic, two piece coach cassette platform with PLS Magic Floor flooring system. This patented combination is designed to provide seamless transfer from roadside to raised passenger deck for wheelchair users. 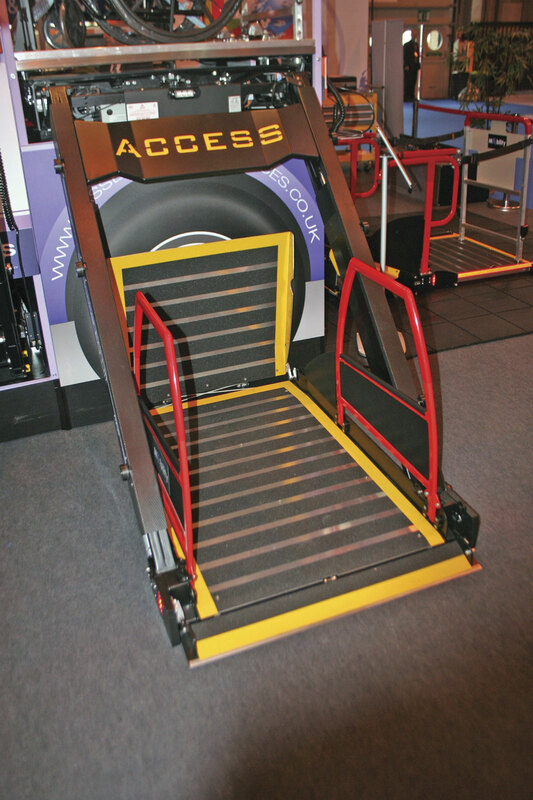 PLS’s range of AccessTM lift solutions also created interest at the NEC. These popular products demonstrated the varying entry points that can be achieved on a coach by PLS engineers. The units can be fitted at the side, front entrance, bottom locker or ski locker for safe lifting and lowering of wheelchair passengers. Like the rest of its products, they were installed on a full size coach rig incorporating three AccessTM lifts. The set up is also used at the company’s headquarters for training purposes. 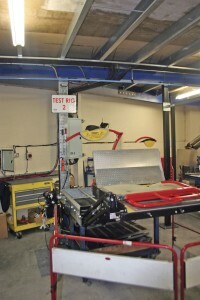 Training can be offered in either fitting the lifts on to vehicles or in maintaining them. This can be carried out at PLS’s premises or at a customer’s site. Training in the lifts’ use is provided during handovers. Something the company is currently working on is a new card scheme for lift repairers. This will see cards handed out with the owner’s photo and what lifts they have been trained to fix. A card printer has been bought for this. 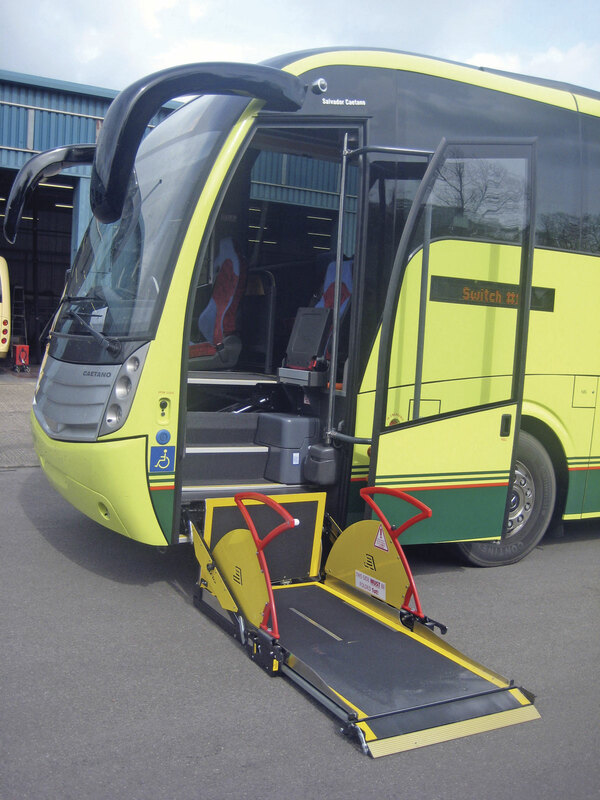 In the past, some coach lifts have been worked on by people only trained for minibus lifts. ‘This will eliminate some of the “less than professional” element in lift repairers which is unfortunately present,’ said Adam. This is due to be introduced during February. The new training cards are part of PLS’s forward thinking strategy. This is also the reason why it added the option of GPS tracking to its EQ Coach Ski-locker Lift. Making this feature available is all part of ‘keeping ahead of the game’. Adam wants to get to the position where the company receives a message that the lift requires a service or some kind of attention, ensuring it is properly looked after and avoids failing, increasing their reliability. After all, if a coach lift breaks down, the vehicle itself could be off the road and not earning money. In National Express’s case, if one of their passenger lifts fails, a replacement coach needs to be provided, meaning an extra cost for the operator, inconvenience for passengers and a disruption to the schedule. It continues to develop other new products beside lifts, such as the Doorsafe aperture safety device. This system is designed to help prevent accidents whilst the exit doors are open and the lift is not at full vehicle floor height. It is intended to prove useful during the confusion of transporting multiple passengers; the operator can have peace of mind that if the lift is not fully up to floor height the Doorsafe arm will help prevent a passenger or operator from accidently stepping out of the doors. Passenger lifts are becoming a much more common feature on coaches, said Adam. He gave the example of Plaxtons and Irizar, who even though they may not necessary install lifts on all coaches they build, they now put the facility in place for them to be fitted at a later date. Another area PLS is working in is its instructions. In this country, all passenger lift operators require training before they can use the devices, but this does not mean they are all used safely all the time. 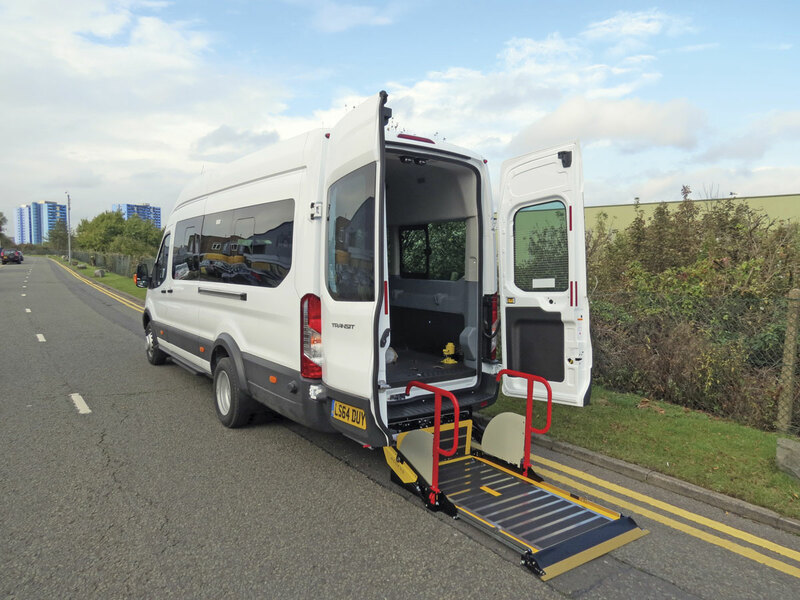 Adam explained that while CT minibus drivers may keep in practice when it comes to operating lifts, the same may not be said of all coach drivers who might only use them perhaps ‘once or twice a year’. As such, the company is working on making its products’ instructions as easy to understand as possible, using more pictorial guidance and less text. PLS’s position as the leading provider of cassette lifts into the UK market has been earned over the years and there is every likelihood that it will maintain that position, considering its efforts to stay ahead of the game and continually advance and develop its products. Demand for lifts, both for new build and retrofitting, is set to increase as we approach 2020 and PLS intends to ensure that it has everything in place to meet the needs of the industry and its passengers.